Today’s Inspiration Challenge on Splitcoast (IC510) is a Pinterest Board full of beautiful drinks. I was really inspired by THIS picture Audrie picked & I tried to find it on the board but gave up after the first couple of thousand pictures, lol. I think that board has no end! 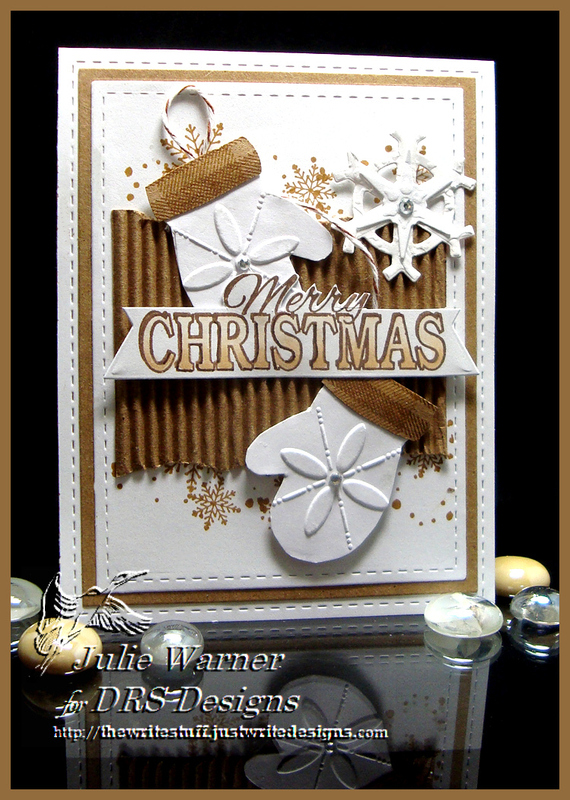 I was also inspired by a card I saw who knows how long ago or where that had these cute little mittens & crimped kraft paper. Since it’s all about drinks, it’s appropriate that I had one of those coffee cup wrappers & used it for my crimped layer. 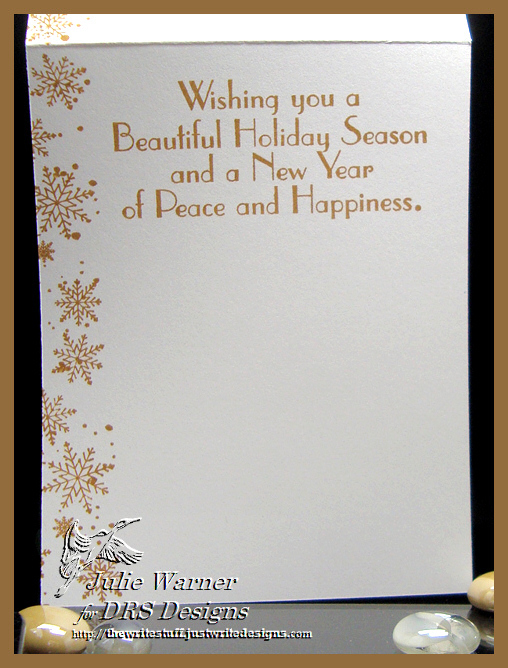 I stamped the snowflakes & splatter on a white front using corduroy distress ink then attached the card board. The mittens were a little trickier..I have a mitten punch, but it was nowhere near big enough. I punched 2 mittens out of a piece of scrap kraft c/s, put them on the copier & blew them up about 200% then cut those out to use as templates for my white mittens w/ kraft colored cuffs. Ahhh…perfect size! I also stamped the cuffs w/ the woven plaid border & embossed a snowflake on each mitten before adding them & some twine to join them. 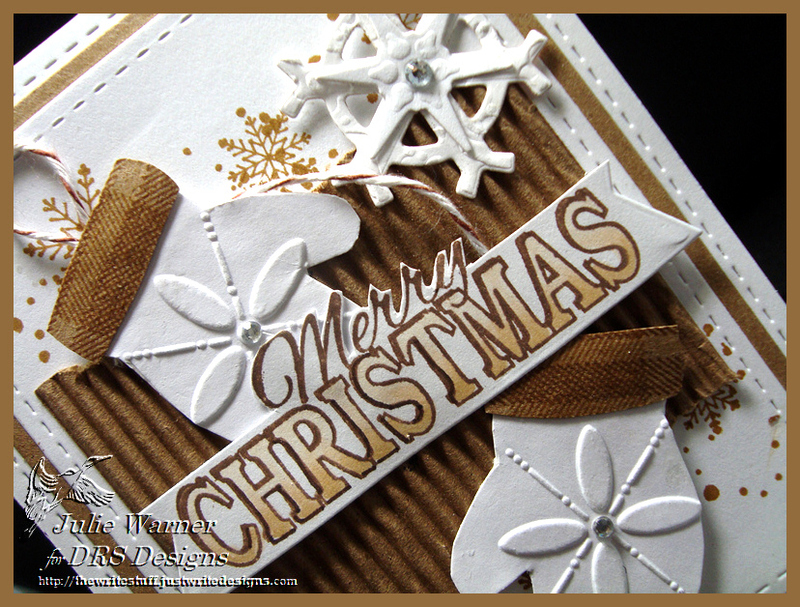 The greeting was stamped w/ sepia Versafine & I used a couple of earth tone Tombow markers to color. The bottom was cut w/ a die & I hand cut around the top. Here’s a look at the inside. Thanks so much for stopping by! Be sure to check out the DRS Thursday Challenge! This week…make it a Real Cutie (use any image, die cut, punch that’s cute). DRS images are not required & there’s a nice prize up for grabs. 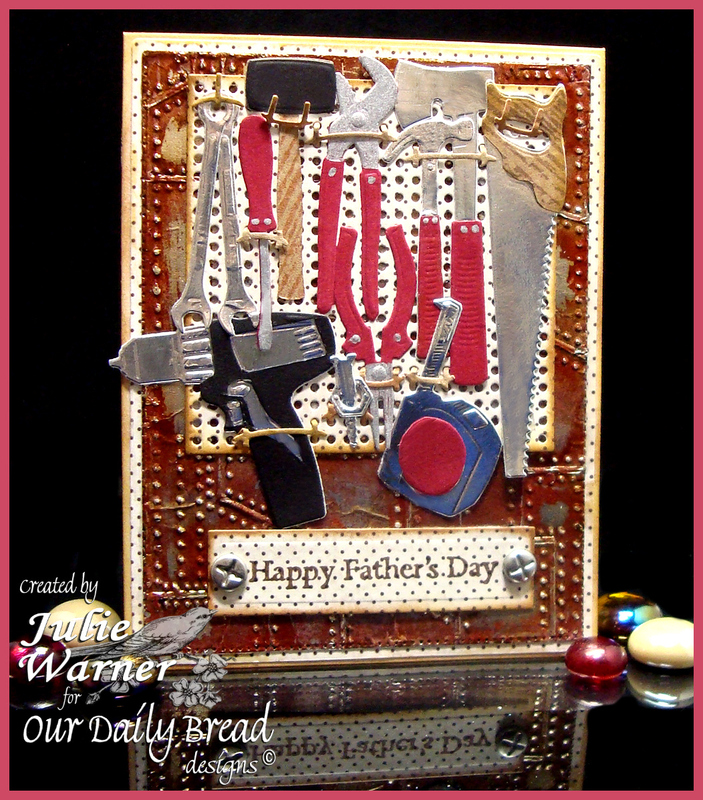 Today’s Ways to Use It Challenge(WT536) is Get Grungy! I think a tool pegboard would be grungy enough, but I also grunged up background quite a bit. To make the large bg, I glued some heavy duty aluminum foil to card stock & embossed it. I covered the entire piece with white acrylic paint & after it dried, I sponged on some Distress inks then sanded some areas down. 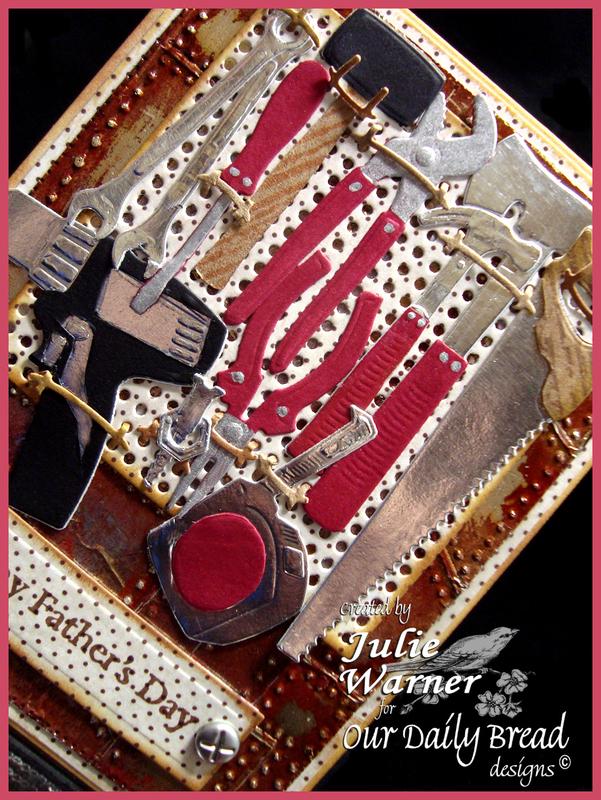 The pegboard was die cut out of dp & the edges were sponged before I attached all the tools. I also used foil covered c/s for the tool heads. A couple of screw head brads were attached to the greeting. Welcome to part two of the January challenge for Serendipity Stamps! We’re switching things up a bit in 2014…The challenges will now be MONTHLY so you have longer to play. The design team will still provide inspiration twice a month (every other Wednesday), but you will have the whole month to play along! The Serendipity Challenge this month is Buttons. And for the Design Team, we’ve added the twist of using the chalkboard technique with the buttons.You can find all the details on how to play along with us at the Serendipity Stamps Challenge Blog. With each challenge we always have a gift certificate up for grabs to a random player. The sale of the week is Free Shipping on all continental US orders $10 and up, good through 1/22/14. For my Sunny Chalkboard card, I stamped the wonderful quote with white chalk ink onto black card stock. I used a white gel pen to highlight the frame and letter K then used a sponge and a very light touch to add some “chalk dust” to the background. The half sun image was stamped on white, colored with Copics and I trimmed around the rays to insert the chalkboard underneath. The black grid layer is a left over from a painted grid technique using white acrylic paint and drywall mesh. A few die cut buttons were stacked and added to the corner. The finished card is 5.50 x 4.25 and these are the Copics I used. Thanks so much for stopping by! Please stop by and visit all of the DT blogs!